Create contrast with this white screen room divider. Our room divider can look very sophisticated in an all-white interior, but it can also form a great contrast in an interior filled with vibrant colors. 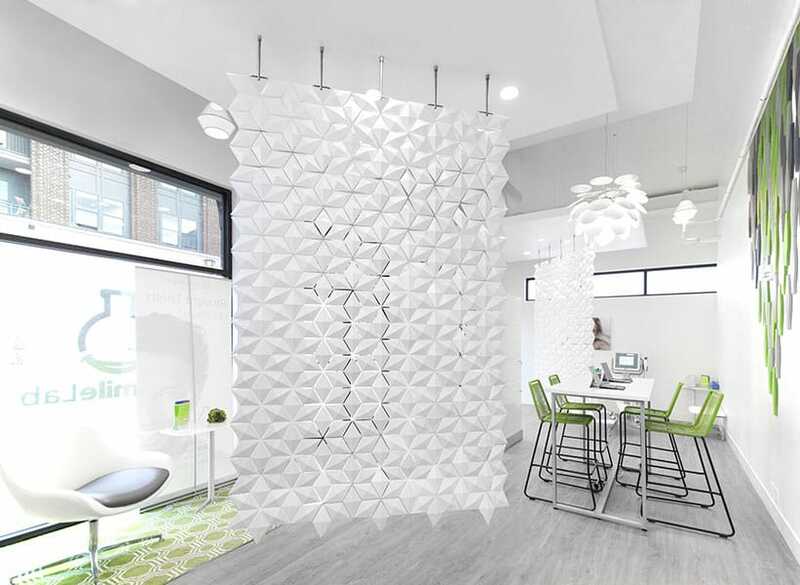 In the photos on this page, you can see our room divider hanging The Smile Lab in Lexington, USA. You can see the effect of combining it with white walls, a white ceiling, and a white lamp shade to get the feeling of what it will look like in an all-white setting. The space has also some bright colored objects. You can see what the white screen room divider would look like in combination with a colorful interior. It does not matter with what colors you choose to combine it, our white screen room divider will form a dazzling eye-catcher in your home, store, office or hotel! The Dutch Design Week showed us there is a lot of upcoming talent and they remarkably come in duos. For Bas and Mireille it all began at the Design Academy. It was suddenly 'bloomming' between this golden couple and since then they have worked together. Their roomdivider Light Facet makes it possible to play with light and shadow. This year Bloomming has presented itself on numerous locatons in Eindhoven, Brussels, Utrecht, Amsterdam, Rotterdam and Hong Kong.